Prof. Shenoy heads the Neural Prosthetic Systems Lab (NPSL) at Stanford University where his group conducts neuroscience and neuroengineering research to better understand how the brain controls movement, and to design medical systems to assist those with movement disabilities. His neuroscience research investigates the neural basis of movement preparation and generation using a combination of electrophysiological, behavioral, computational and theoretical techniques. His neuroengineering research investigates the design of high-performance neural prosthetic systems. These systems translate neural activity from the brain into control signals for prosthetic devices, which assist disabled patients by restoring lost function. This work includes statistical signal processing, machine learning, low-power circuits, and real-time system modeling and implementation. 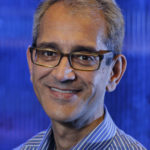 Prof. Shenoy is the co-director, along with Prof. Jaimie Henderson, MD, of the Neural Prosthetics Translational Laboratory (NPTL, established in 2009). NPTL is focused on clinical translation of neural prosthetic systems and is part of the Stanford Institute for Neuro-Innovation and Translational Neuroscience (SINTN) and Stanford’s Bio-X / NeuroVentures program. Education and selected awards and honors include: BS EE (1990, UC Irvine), MS EE (1992, MIT), and PhD EE (1995, MIT) degrees; postdoc in neurobiology (1995-2001, Caltech); Burroughs Wellcome Fund Career Award in the Biomedical Sciences (1999); Assistant Professor, Stanford University (2001-2008); Alfred P. Sloan Research Fellow (2002); Defense Science Research Council (DSRC/DARPA) Fellow (2003-2005); DSRC/DARPA Member (2005-2009); IEEE Senior Member, Engineering in Medicine and Biology Society (2006); McKnight Technological Innovations in Neurosciences Award (2007); Professor (tenured), Stanford University (2008-); Charles Lee Powell Faculty Scholar, School of Engineering, Stanford University (2008-2011); 2009 NIH Director’s Pioneer Award (2009-2014); and 2010 Stanford University Postdoc Mentoring Award.